When your home experiences a plumbing failure, it can damage carpet, drywall, appliances, and stored personal possessions. A plumbing failure is more likely to be covered by an insurance company than groundwater flooding damage. The most common claim that insurance companies pay out on homeowner's policies are related to water-damaged homes. While groundwater flooding is a major part of this, plumbing failure is also a highly significant factor. This kind of damage can be extensive in walls, floors, and with everything stored within the flooded area. The mold that follows a flood can create allergens that can lead to serious long-term health effects. Unfortunately, it's not possible to prevent all pipes, toilets, sinks, tubs, faucets, and other pieces of home plumbing from ever experiencing a leak. However, there are some simple, common-sense steps that can be taken to prevent some of the most common plumbing failures that occur. At Bowman Masonry & Waterproofing we suggest installing two simple, effective solutions for the most avoidable basement flooding causes. These simple add-ons are easy ways to ensure that you have the best plumbing failure protection available. Prevent the most common causes of plumbing leaks in basement spaces. To schedule your free, no-obligation basement waterproofing quote, call or e-mail us today! We're proud to serve Saint Marys, Bellefonte, Altoona, State College, Du Bois, the surrounding areas of Pennsylvania Furnace, Brockway, Port Matilda, Tyrone, Ridgway, Kersey, and many nearby areas. Sump pump systems can flood for many reasons, including clogged drains, frozen discharge lines, and pump burnout. Whether your sump pump has an issue or your home has a plumbing failure, you're going to want to know as soon as possible. To help keep you informed of any potential floods, each of our systems has a built-in WaterWatch® Sump Pump Alarm included in its installation. This will sound off when a flood occurs, letting you know right away. Our newest systems also include the option of being tied into many home alarm systems for ultra protection -- so you receive a phone call when the alarm sounds off. Our sump pumps also include a floor drain with a unique ball-and-cup design. When water from the floor enters the drain, the ball floats, and the water flows through. When the water is gone, the ball returns to the bottom of the drain, sealing the opening from humidity and odors that would otherwise rise from the sump pump pit. A water heater has a lifespan of approximately 7 years. As they begin to fail, old water heaters can lead to significant volumes of water leaking on your basement floor. This can lead to damage to carpeting, subflooring, furniture, and stored items. Over the course of your home's life, you will need to replace your home's water heater several times. An average water heater system lasts about seven years. Because all water heaters are designed to automatically refill themselves, a failed water heater will leak for as long as it has access to a water supply. In extreme cases, we've seen several feet of flooding on the floor when water heaters fail. We recommend installing the FloodRing™ Water Heater Flood Protection System to protect your home from water heater floods. The FloodRing® system includes a 4" PVC ring that's designed to collect water from your water heater, where it is then directed to your perimeter drain. Combine the FloodRing™ with our WaterWatch® Alarm, which is placed inside of the ring for added protection. Like our sump pump alarm, it will sound off if it detects water, and can also be hooked up to some home alarm systems. More about our water heater flood protection. We Protect Basements From Plumbing Failures And Flooding! Whether water from a flooded basement comes from the home's plumbing or from the earth around the foundation, the results are the same -- a wet basement, and damage to everything inside. At Bowman Masonry & Waterproofing, we want to help you keep your basement dry and flood free. To help you decide which options would work best for you, we offer free basement waterproofing quotes to all homeowners in our Pennsylvania service area. To schedule your free, no-obligation quote, call or e-mail us today! 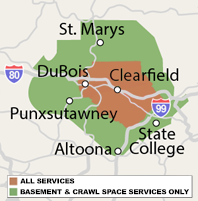 We proudly serve Du Bois, State College, Altoona, Saint Marys, Bellefonte, surrounding areas such as Kersey, Port Matilda, Tyrone, Pennsylvania Furnace, Ridgway, Brockway, and nearby.